I grew up on game shows. Jeopardy. Wheel of Fortune. Family Feud. The Dating Game. My favorites were the celebrity editions where we, Jane and John Does, sitting on our couches across America got to see famous people unscripted. To laugh alongside them like we were all a bunch of friends having pizza and soda round the game table. My husband and I still tune into Jeopardy, shouting out the answers before any of the players have buzzed. Game shows of every variety equalize the millionaire actor and the street vendor under the banner of “contestants.” A person’s past or even how they arrived on the show is inconsequential. All that matters is the present. That accessibility to the masses and acceptance of the character game rules are attributes shared by literature. It’s why, as readers and writers, we get excited seeing a particular book we’ve read in the hands of a Hollywood star, political leader, or other esteemed person. We feel, “Me, too!” even if we don’t consciously think or say it. 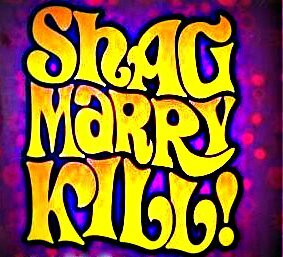 So I went on a social media hunt for the current popular sport and found this all-inclusive gem: Shag, Marry, Kill. It seems everyone from superstar chefs to decorous journalists are being put on the spot to play. Well, I said to myself, why not authors in a literary edition—this is Writer Unboxed! I snagged three kind friends who were ready to get their game on. Megan Abbott, Edgar-winning author of the novels Queenpin, The Song Is You, Die a Little, Bury Me Deep, The End of Everything, Dare Me, and her latest chosen as best book of 2014 by Amazon, The Fever. Melanie Benjamin, New York Times bestselling author of The Aviator’s Wife, Alice I Have Been and The Autobiography of Mrs. Tom Thumb. Matthew Dicks, author of the critically-acclaimed novels Memoirs of an Imaginary Friend, Something Missing, Unexpectedly, Milo and the forthcoming The Perfect Comeback of Caroline Jacobs (September 2015). The rules are simple: For each question, the contestant must designate which of the three persons he or she would rather shag, marry, and kill. It’s generally hard to say, I’ll shag X, marry Y, and kill Z without some kind of explanation and therein lies our entertainment. The story of why each “shag, marry and kill” were chosen.